Winter was brutal here in the Pacific Northwest. Losing 2 of our beloved horses, Rufus and Ruby, made the freezing temperatures feel that much colder. I heard reports of unusual cold and snow all across this great nation. People were reaching for more layers from East to West, North to South. But with winter, comes the promise of spring. We have shrugged off the frosty overcoats and grabbed our sunglasses as robins sing and frogs croak that spring is definitely here! Sweet piles of shed-out winter coats carpet the barn aisle while wrens select the softest pieces to build their summer nests to welcome their new chicks. Winter tests our trust that the earth will warm, flowers will bloom and baby bunnies will be born to keep the cycle of life going. Each evening when I listen for the cheerful croaking of the thousands of frogs hoping to meet their mates, I am reminded that, indeed, there are things that I can trust in. The arrival of our newest equine friends, Romeo and Robin helped to restore some trust for our kids who had big holes in their hearts for our beloved horses who passed in December. Our new horses are never replacements. No one could ever replace our dear equine family members. Love is not a zero sum game- you never run out. In fact, the more you love, the more love you receive in return. That is something else I can trust. Let me tell about the 2 new loves that have joined our family. 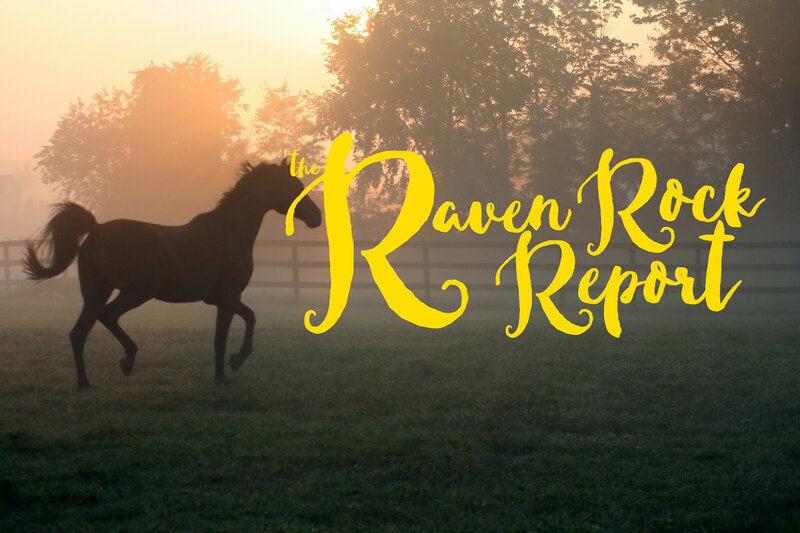 We partnered with Save a Forgotten Equine (SAFE) to bring Robin, a beautiful bay mare, to Raven Rock. She is the same height as Ruby was (13hh) with a sweet temperament and demeanor. Ruthie and she bonded immediately (largely due to kind Ruthie’s motherly instincts). Now, Robin only gets worried when Ruthie leaves the pasture with one of her kids. That is quite common for a new horse to fret when their “security blanket” in the form of a lovely Fjord mare (Ruthie) is removed from her presence. No worries, it will take a few more months of feeling supported and safe for Robin to be confident and trusting enough to be by herself when Ruthie leaves briefly. It happens for all new horses. Robin is wonderful with her new children and loves working with them. Every horse needs children of their own. Romeo’s “security blanket” is Rosy, our smallest mini. Romeo is a beautiful, well-trained Shetland/miniature cross gelding. He has moved into a small herd here, finding safety with his girlfriend Rosy and his playmate Rocky. Reo is the Alpha of that group, so he bosses everyone just enough to let them know there is a leader amongst them. It is a lot of responsibility for Reo, as all of his herd trusts him to keep them safe. Romeo is an adorable black and white pinto. Just what every little kid dreams of. I know I did. One very small, slim 9-year-old who comes to the ranch has had to find trust where there was none to be found. Her own parents were abusive and now one is in jail, while the other committed suicide. She moved in with distant relatives in another state; kind people whom she had never met. After hearing her story, I knew that this would be an up-hill battle to find just the basics-self-worth, courtesy and regulated behavior, and, of course, trust. For a young girl who could not trust those who were supposed to love her, how could she trust those she didn’t even know? How could she listen to and believe people who said they would take care of her and her 3 siblings, but why? Did they even like this “instant family”? She had been betrayed before. The problem with this truth is that if you don’t know the Lord, you can’t trust Him. Our horses provide a “bridge” so that the children can learn to trust-first their horse, then the parents and guardians, and finally, the only real Hope-God. Her new family taught her about God the Father, someone she could not see, but should feel. But she couldn’t feel anything right now. Oh, some rage came through and some anger. She didn’t even know why, so it was useless to ask her what was wrong. Trauma is in the body not in the memory as we might think. Especially traumatized children cannot have a memory of those things- it is too horrible. So at Raven Rock, we begin with a horse. One who is drawn to that individual child. Rocky followed her around like a big puppy when she was meeting the herd. That guy decided long before that little girl did, that she was HIS.